What Are These Tiny Blue Flowers In The Yard? 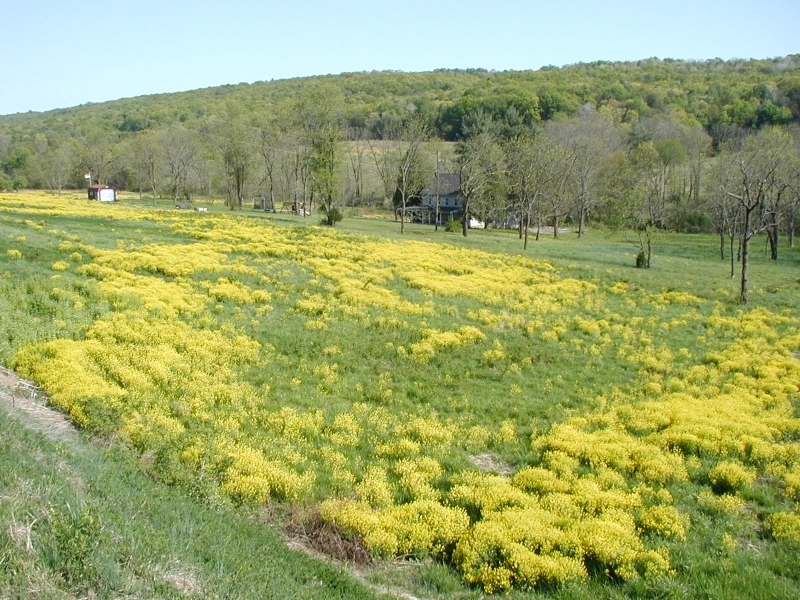 Flowering plants number in the thousands or hundreds of thousands actually. Indeed, the huge variety of types of flowers is one thing that draws me to them…the seemingly infinite arrangement of colors, shapes and sizes. Sometimes I find a flower that is more of a curiosity than anything else. Take for instance these tiny little flowers that come out in early spring. 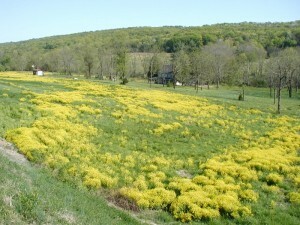 You can find them appearing in flower beds and walkways, along roads and in lawns. To find out what these little plants are, you’d need a weed book, I guess. 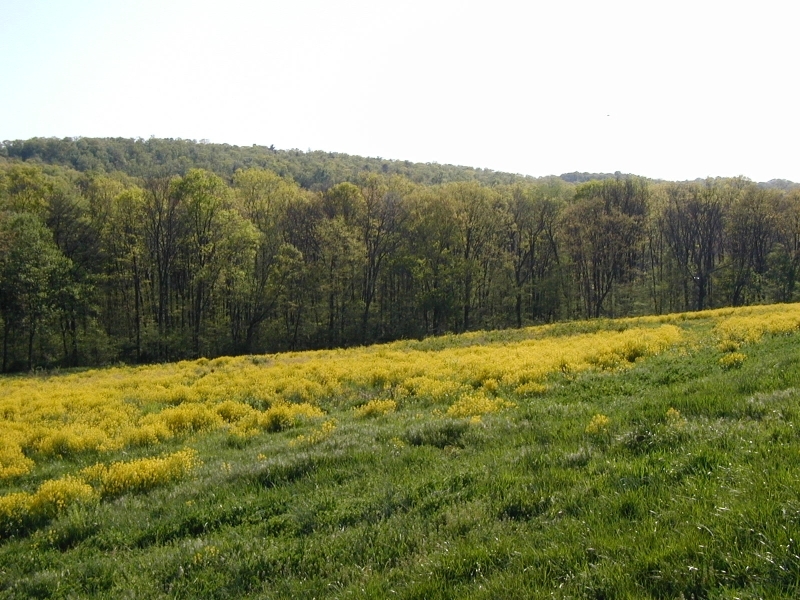 The flowers are so tiny as to disappear from view in a short distance. With blossoms that are 1-2 mm across, these posies won’t appear in a wildflower book for their flashyness. Not exactly eye-catching, unless you’re on the ground with them. 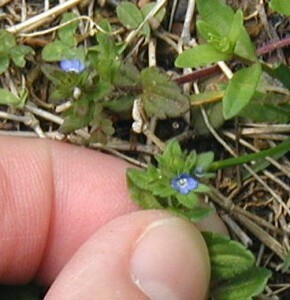 Those that we see in the lawn near the garden have a tiny blue flower with four petals. In the center of the blossom is a white ring that surrounds a couple of light-colored stamens. The flower looks like it belongs to the Speedwell group. The plant has a sprawling habit as it sends out hairy, maroon runners in all directions. The broad, spade-shaped leaves along the runners are scalloped on the edges and lie opposite one another. Where the runners terminate, the leaves become less broad and they’re more tightly packed together. Flowers appear singly in the leaf axils. 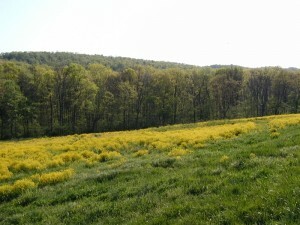 Photos taken 3 May 2011. 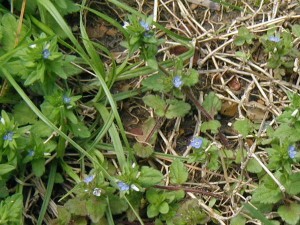 Tiny blue flowers appear at the end of maroon-colored runners. Tiny blue flowers magnified 3X. Right next to the tiny blue flowers were a bunch of tiny white flowers. These little curiosities appear in the lawn each spring. The tiny white flowers seem to be a form of speedwell also, with opposite leaves that are jagged or notched. 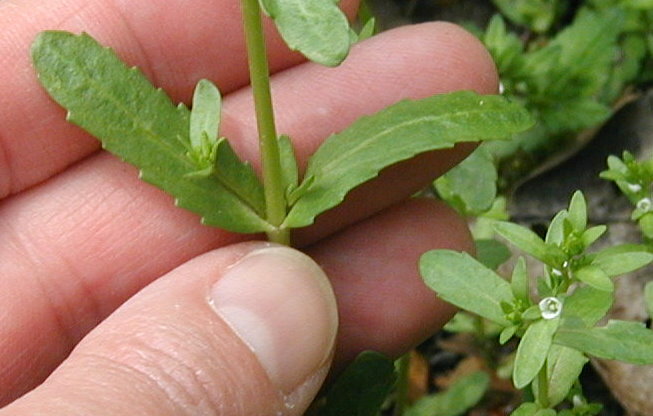 The leaves are similar to those of the tiny blue flower, except drawn out or stretched into thinner, oval shapes. The white flowers have fours petals and occur at the leaf nodes, not terminally. 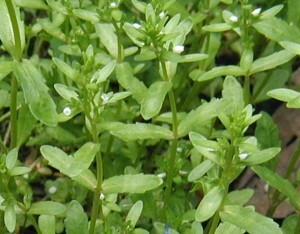 Overall, the tiny white flower plant is taller and has more vertically rising stems than the tiny blue flower plant. Stems grow vertically in the tiny white flower plant. Notched, oval-shaped leaves are stemless on this yard weed. So, it’s just a curiosity I have about these little plants. I suppose that ants or flies would pollinate the tiny flowers. Plenty of them get pulled out of flower beds or mowed down by the lawnmower, but sometimes they come back. 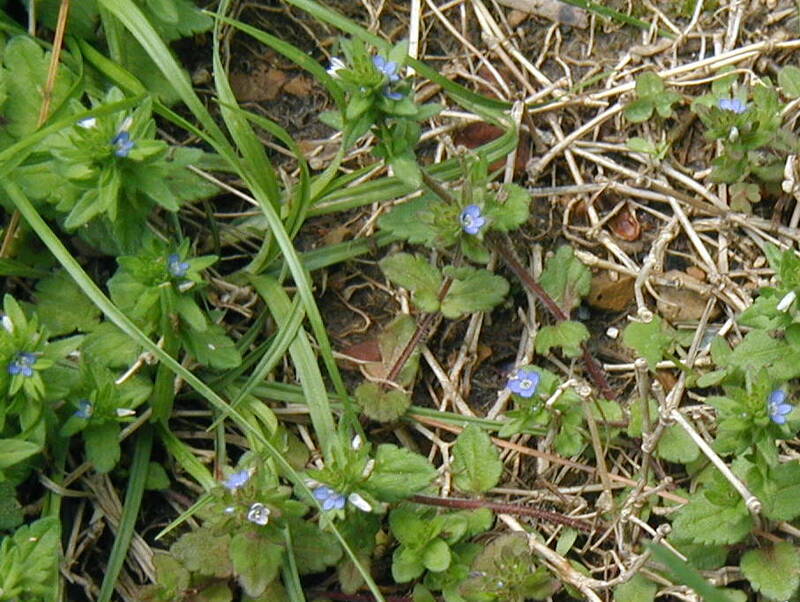 It turns out that the tiny blue flowered plant is called Corn Speedwell, Veronica arvensis. I came across its picture when looking up Blue-Eyed Grass in the Audubon Field Guide to Wildflowers . Corn speedwell is not native to America, nor does it appear to have edible or medicinal qualities.